A very useful introduction to the $35game-changing small computer designed for education but used for countless other projects. This is the book written by the Man with the vision behind the Raspberry Pi Foundation. Against a backdrop of the story of computing at the end of the twentieth century, this huge essay asks deep and meaningful questions about life the universe and everything. It is a fascinating, entertaining and thought-provoking read; I thoroughly recommend it. 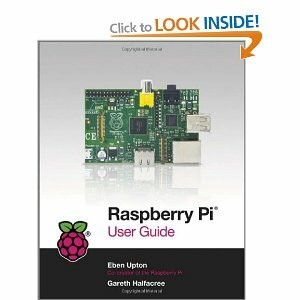 So you've got your Raspberry Pi, maybe as a Christmas present, and you've followed the Quick Start Guide. You've got a black screen with confusing white text, and you've managed to "login", whatever that means. What do you do now? Probably, before you've got comfortable with the "command-line" environment, you'll want to start the windows environment every time. Just type "startx" and hit Enter. It looks a bit different, but it works just the same as Microsoft Windows: the Start button is that odd-shaped thing in the bottom left-hand corner, or you can double-click the icons to start them. 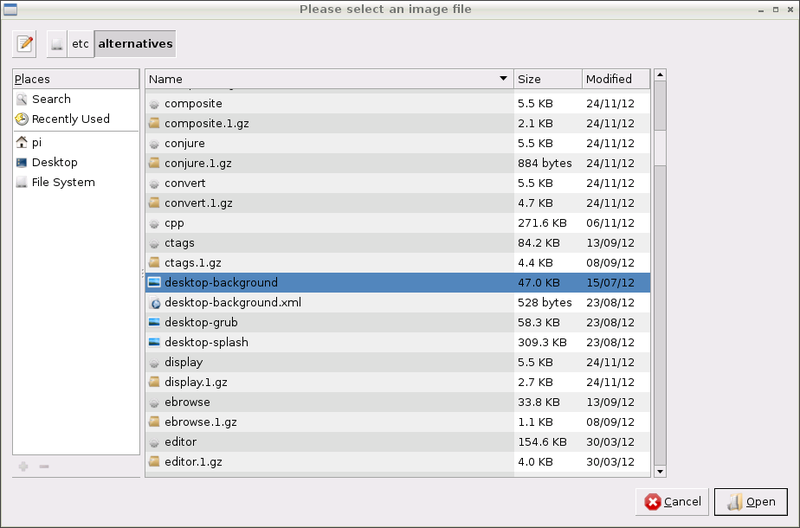 At the top of the dialog is the name of the file. Feel free to change that to something meaningful. On the left is a selection of useful places you might want to save the file. We will save it to our home directory which is called "pi" (remember from when you logged in, pi is our username). We could create a sub-folder for it or put it in one of the existing folders by selecting them in the right-hand panel, just like in Windows. So for now, make sure "pi" is selected on the left, change the name if you want, and hit the "Save" button. 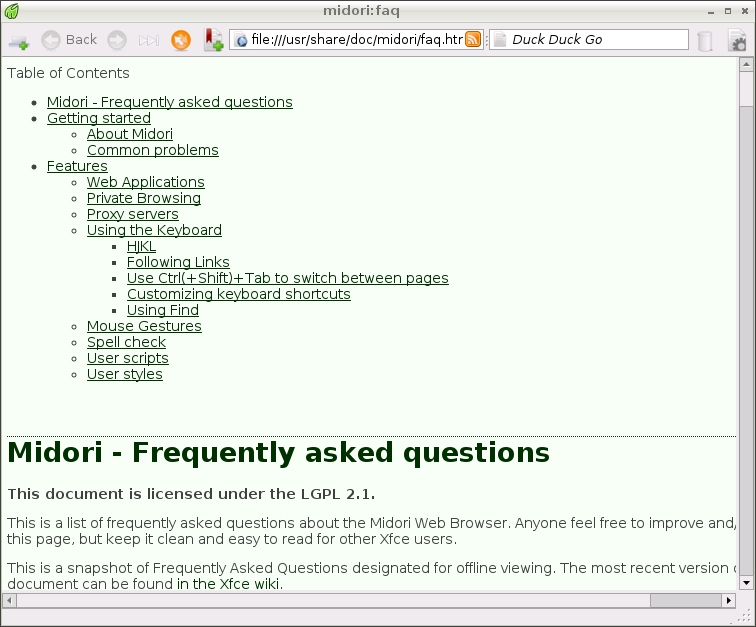 We've got our picture, so you can close Midori now. We've got a pretty picture, so now we need something to do with it. Right click anywhere on the desktop background. Here's that file dialog again. 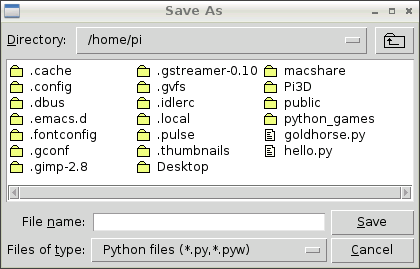 This is an open dialog rather than a Save dialog, so there is no name on the top, just a list of folders. You can see that we are not in any of the usual places from the left-hand bar. Instead we are in a particularly obscure folder. That's just because that is where the picture of the raspberry is stored. All we need to do is to hit the "pi" in the left-hand pane to go back to the home directory, and then double click the picture you want to use. Immediately the screen background changes. You may want to change the "Wallpaper mode" to "Stretch to fill the entire screen", or you may want to change the background colour to suit. I'm sure you can cope; just play around if you are uncertain. The colour dialog is particularly strange if you haven't seen anything like it before. When you're happy just hit "Close". If you want to program in Scratch, the icon is there on the desktop. Pick up a copy of the MagPi and have a go. For this introduction I'll be using Python, which is just a bit more fiddly. You've got the Python Shell window open and it is sitting there with a ">>>" prompt waiting for you to type something. Just to keep it happy, type "5+3" and hit Enter. It is possible to do a fair amount in the Shell window, but to write programs that you can run more than once, we will need to create a file with them in. The colours will be different. This website recognises Python language, and so does IDLE, but they colour things differently. Save the file by going to the File menu and selecting Save. Save it in your home directory and call it "hello.py". Now isn't that helpful? Just when you've got used to one file dialog, another comes along. There's reasons for that, but I didn't do it, so don't blame me. Anyway this one looks more like the file dialog in Windows, and your home directory is already selected. So all you need to do is type "hello.py" and hit "Save". And there it is: your very first Python program. If you got some strange "Traceback" error message, don't worry; so did I (I called the "raw_input" function "rawinput" at first). Just check very carefully that the program is exactly the same as it appears above, down to the smallest coma. 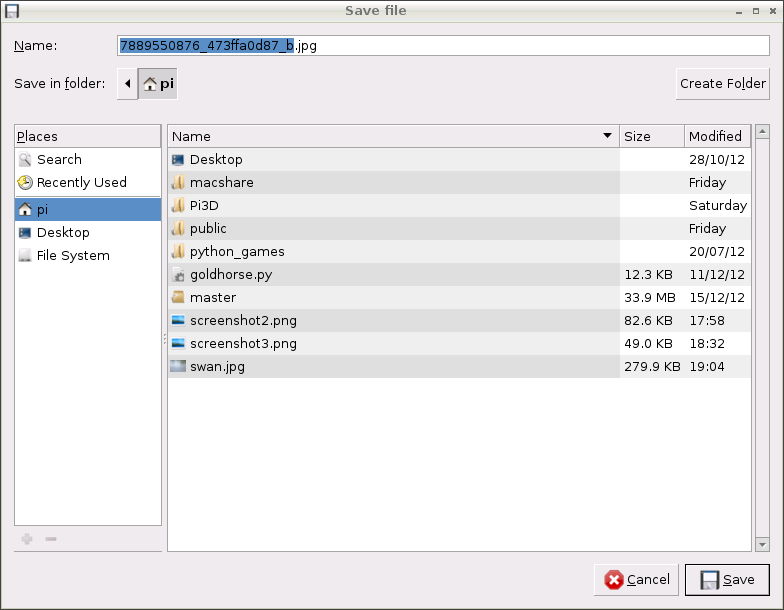 Now you know how to run Python programs on the Raspberry Pi, you can go through an online tutorial that will teach you how to write programs. There are several here. A quick warning before you go. With Microsoft Windows you are probably used to typing things in UPPER-CASE sometimes and lower-case at other times, and now and again All hIggLdy-PigldY just for fun. Well you've got to stop. 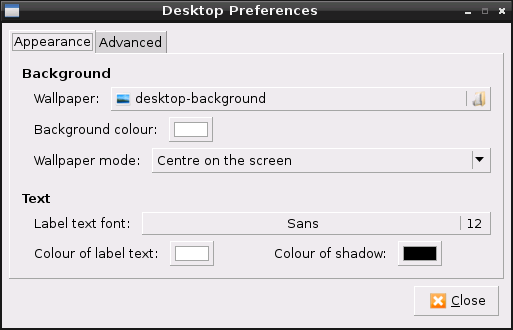 Linux does not ignore the case of the characters you type. It takes very careful note. For instance you can have a file called "hello.py" and another called "Hello.py", and a third called "hello.PY", and they are all different files with different contents. Think "That's a neat trick"
Have several files that have the same names but with different cases. Decide to use only lower-case names. This might be a silly question but I'm trying to get my brother into the idea of "DIY" projects. This seems like right up his alley. However, being 13, he's going to expect to be able to utilize Facebook, Instagram, etc. He's going to want to be able to upload and save images. That is possible, correct? Also, is it possible to transfer files (images, videos, etc.) via the USB port? The Raspberry Pi is not a good replacement for a PC. It is slow and it doesn't display Flash video. However, the answer to your questions is "yes". It can do all that and, for most of it, it is good enough. The sites you don't mention that will be problems are Youtube and Netflix. I think it is possible to get Youtube working, but probably only by installing a different browser. Netflix will probably never be supported. 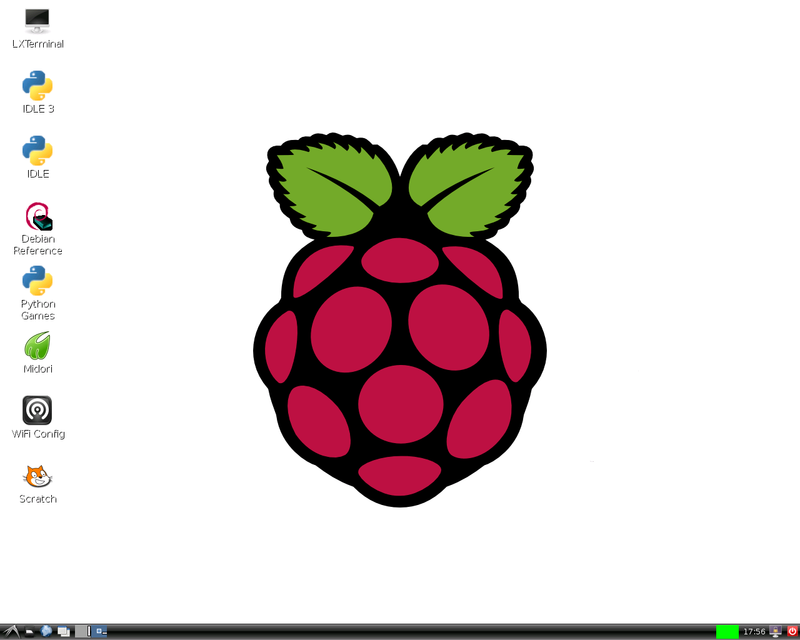 You can get more advice over on the Raspberry Pi Forum. They're very friendly.